A powerful tool to transforms static digital djvu('déjà vu') document into classy turn page interactive brochures that will impress your target audience! Converting DJVU into stunning digital flash page flip publication in seconds. No size/page number limits using desktop converter to the creation of online publications . Flip DJVU - Create digital Realistic Page Flip Books from DJVU document. 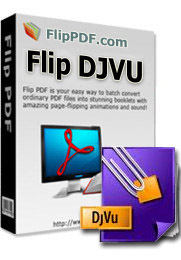 Designed for 3D interactive page-turning FlipBooks, Flip DJVU is innovative conversion tool for creating page flipping editions. Publish magazines, newspapers, brochures and catalogues online. Flip DJVU easily creates page flip book Editions, HTML5 mobile web editions, iPad, iPhone and Android apps for you in a few seconds. Glory your website now, blog or advertise with this DJVU to Flash converted stunning 3D animated page flipping book and create your own online presentation or offline reading book. Flip DJVU offers fully customised desktop page turn direct from DJVU files and fully customisable mobile apps for publications using our suite of apps for both Apple and Android devices. At a Glance: Easy! 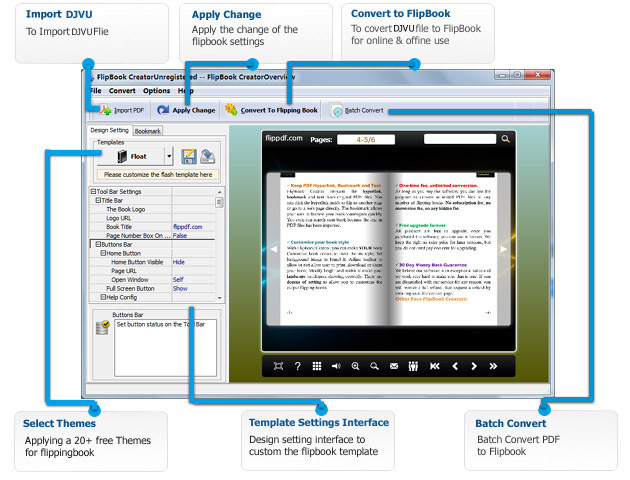 Even a new user, you can use Flip DJVU within a couple of minutes without any special learning. With our easy to use interface, you can make a digital publication in a few mouse clicks! Even a new user, you can use Flip DJVU within a couple of minutes without any special learning. Beside Flash version, all publications created by Flip DJVU will also include HTML5 version. The readers will be able to open your flip page publication in any environment (PC, Mac, iPhone, iPad, Android, or Windows Mobile), and you can even publish at your Facebook page. Flip DJVU supports create table of contents. After that, you can edit the table of contents. If you want to create it by yourself, Flip DJVU can help you to create table of contents for your digital publication. If you have a Google Analytics account, you can make use of Flip DJVU’s built-in functionality Google Analytics Embedding. The code of Google Analytics can be embedded to each book and all statistics will be available from your Google Analytics account live. Create, design, control and increase your marketing effectiveness using Google Analytics within the publications. Once you have purchased the software, you can use the program to convert an unlimited number of DJVU files to any number of page-flipping eBooks. No subscription fee, no conversion fee, not limited to a single website.